Teleflorist has been dominating the flower retail market since 1947. It went online in 2009, and has been maintaining a strong digital presence ever since. In 2010, Teleflorist merged with The Euroflorist Group. It is a beneficial relationship, considering Euroflorist is currently the market leader in Europe for worldwide flower delivery with over 10,000 affiliated florists. Teleflorist works with over 2000 florists in the UK and Ireland. It can deliver to almost any address in Ireland and the British Isles, as well as to over 140 countries worldwide. All our florist delivered flowers are freshly prepared and hand delivered by professional, local florists. If you’re in a real hurry to get a bouquet sent to someone special, you would benefit from using the Same Day flower delivery service, which is available when you order before 3pm Monday to Saturday. You’ll be pleased to know that Teleflorist supports regional economies by employing local florists for its Hand Delivered products. No matter where you’re sending your flowers, or if you’re a lucky recipient of a Teleflorist bouquet - you’re guaranteed flower freshness for 7 days. How do I use my Teleflorist discount code? Find and copy your code from vouchercloud. Click ‘shop now’, and wait to be directed to the Teleflorist website. Choose your bouquet, then go to ‘checkout’. Click the ‘I have a discount code’ text, enter your code and then click ‘activate’. Click ‘continue’ to go through to the payment procedure pages. Enter your email address in the box on the home page and receive news and special offers direct to your inbox. Why are my Teleflorist flowers sent while still in bud? This is prolong the life of the flowers, the flowers wouldn’t last as long if they arrived in full bloom. What happens to the Teleflorist order if the recipient isn’t home? If the flowers are delivered by courier or Royal Mail, they will leave the flowers with a neighbour or trustee, or alternatively they will leave the flowers in a safe place, with a calling card detailing the delivery to the recipient. Can I track my Teleflorist order? As a rule, deliveries take place between 09:00 and 18:00, Monday to Saturday. However, if you’d like an update on the status of your order, contact Customer Service or by Live Chat on the website. Delivery cost is dependant on the size of the bouquet and speed of delivery. Details of delivery pricing is displayed on the product page. You have the right to cancel your contract before you receive the flowers or to return any flowers within 7 working days after the date of receipt. If you have already received flowers from Teleflorist and wish to return them, please follow the returns policy set out in clause 11. 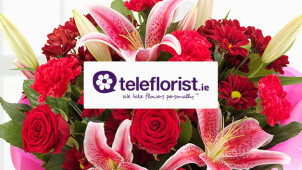 Teleflorist is an online service, so you can shop 24 hours a day, 7 days a week. If you wish to order over the phone, you can do so between 9:00am to 5:00pm (Mon to Fri). Or 9:00am to 3:00pm on Saturdays. Teleflorist is a fast and efficient online flower delivery company. If you have a Teleflorist discount code, why not use it to lighten the load when you purchase a gorgeous bouquet for a loved one, friend or a special work colleague. Whatever you have to celebrate or thank someone for, nothing says it better than a big, bright bunch of fragrant flowers. Choose a bunch to suit your budget and get it delivered same day if necessary. Ever wondered why your flowers don’t last, even if you’ve used the little sachet included in the bouquet? Well, let Teleflorist tell you how to prolong the life of your flowers when you follow the simple ‘Hints and Tips’ on a dedicated aftercare page of the Teleflorist website. You will learn about how to cut the stems, what kind of room temperature is ideal for cut flowers and other helpful care instructions. Teleflorist sells a bunch of flowers suitable for every occasion, so we’d recommend you go to the Flowers by Occasion page next time you need to pick some blooms for an event or special social get together. Grab a Teleflorist voucher code and save money on a bouquet for a loved one’s birthday, or to say get well soon or thank you to a friend or work colleague.